Well here I am back blogging again after too long an absence with every good intention of getting it done once more on a regular basis. 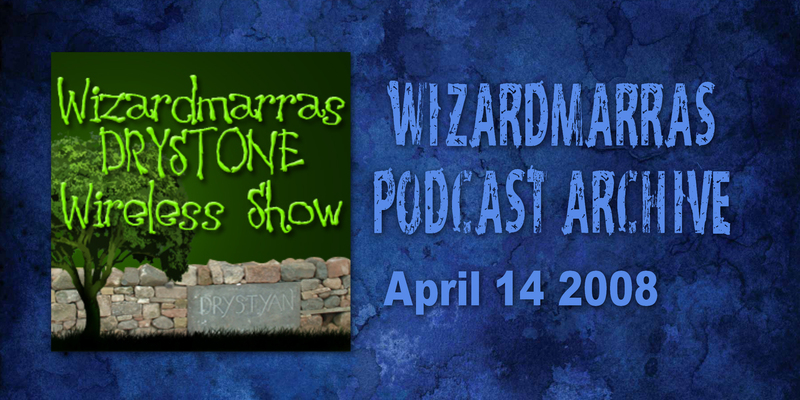 To start it of here are a few details of the very first ever WIZARDMARRAS DRYSTONE WIRELESS SHOW my new podcast in which I’m featuring acts from the past three years of the DRYSTONE STAGE at Solfest and those who will be appearing on it this year. I’ll also be putting some tracks up from artists who have submitted for a slot on the stage but for whatever reason haven’t made it. I can only put on so many acts per year and nowhere near as many as I would like to so it’s a small way to redress the balance. There are some fantastic acts out there all of whom deserve to be heard. I’ll also be playing EXCLUSIVE recordings made at my Open Mic sessions at the Spinners Arms in Cummersdale, Carlisle which takes place on the first Saturday in the month. It’s worth mentioning here that I’m also running one at THE LAST MAN INN in Plumbland near Aspatria on Friday 25th April which will also be a regular session should it go well. Back to the podcast and who’s on it. This sensationally good blues band was on the Drystone back in 2005, its first year after their demo from which this track is taken blew me away. They were back at Solfest on mainstage a year later and also on the Drystone filling in for Dyframix who were unable to attend due to unforeseen circumstances. They will be back on the Drystone at some point, in the meantime enjoy this track which should have a place on a TOP GEAR album or such like pure driving music that it is. Here is their full set from The Spinners. Neither Isaac nor Lucy his sister have reached their teens yet and they are refreshingly unencumbered with the nonsense of ego that besets performers as the years advance. Their playing is fresh and exceptionally good and the excellent recording by Will Taylor of Montgomery Funk Enterprises captures the energy of their set perfectly. Enjoy. A well known figure in the folk music scene in Cumbria and The North of England. A really nice bloke and someone who is far too well preserved for his age. This song Carey from his myspace page is one that I have played and played and played. In short I love it I hope you do too. I nearly missed these guys when they submitted to Solfest and they are also responsible for me starting to take more notice of bands myspace pages. I prefer a demo and listening to a myspace is not always convenient, but I did with these chaps and was taken by their sound. Quite original to say the least, charming and in some ways hypnotic. But never mind me, make your own mind up. The aforementioned Will Taylor performing this beautiful song which I’ll let speak for itself. A show stopping live recording from one of the undeniable stars of The Spinners sessions and fellow compere at Solfest. Finally a track of mine which I’ve entitled Old School Varnish, don’t ask me why I just have. This entry was posted in The Wizardmarra's Wireless Show Podcasts and tagged Bands, Best New Musicians, Great Music, Musicians & Artists, Podcasts, Unsigned Artists by Alan Whittaker. Bookmark the permalink.